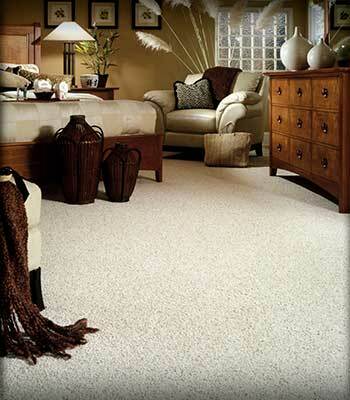 Carpet Flooring Store in Savannah, Ocala, Tallahassee, Ormond Beach and Lakeland. Georgia Floors Direct Georgia Floors Direct flooring stores have thousands of rolls in stock ready for delivery! Carpet Flooring Store – Brighten Your Surroundings! New carpet can entirely change the look and feel of any room. And with today’s technology, carpet is more durable than ever. Whether you’re re-doing a formal dining room or the kids’ playroom, Georgia Floors Direct flooring stores have all the latest styles, fashions and colors; and our expertly trained staff will assist you in making the perfect choice for your home! Stop by our showroom and see our excellent selection of styles, textures and colors. Color: The selection of carpet color is a very personal choice. You will want to select a color that unites your decor and creates the atmosphere you desire. Lighter colors make the room seem larger; darker colors provide coziness. There are also practical considerations in color selection. New stain and soil resistant technology makes today’s lighter color carpet much easier to clean, allowing more decorating options. Medium and darker colors, tweeds, and textures will help disguise common soil in your home’s high traffic areas. The type of fiber used and the way the carpet is constructed (loop, cut, etc.) determines the basic performance of the carpet. Quality can be enhanced by the way the fibers, or yarns are twisted and heat set, and by the density of the tuft. Textures: Carpet construction – how the yarn is “tufted” into backing affects its texture and ultimately, the long-term durability and appearance of the carpet. Level loop pile: Loops of equal height. Generally offers long lasting wear for high traffic areas. Many of today’s popular Berbers are level loop. Multilevel loop pile: Usually have two to three different loop heights to create pattern effects. Provides good durability. Cut and loop pile: Combination of cut and looped yarns. Provides variety of surfaces textures, including sculptured effects. Frieze: The yarns in this style are tightly twisted to create a curly, textured appearance. This style also minimizes the appearance of footprints and vacuum marks and is extremely durable. Velvets – Smooth, level surfaces; formal atmosphere. Saxonies – Various surface finishes; versatile performance and appearance. Textures – Informal atmosphere; suitable for whole house application. Minimizes footprints. There are many kinds of carpet and new carpet stain resistant fibers. It would be best to ask one of our consultants about the best care solution for your style of carpeting. 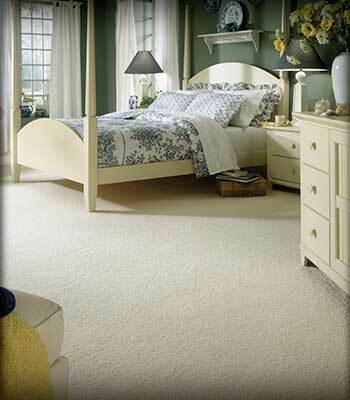 Your budget and your needs are two key elements in selecting carpet. There is a wide range of choices and costs from which to make your selection. Ask yourself how long you expect to keep your carpet before replacing it. 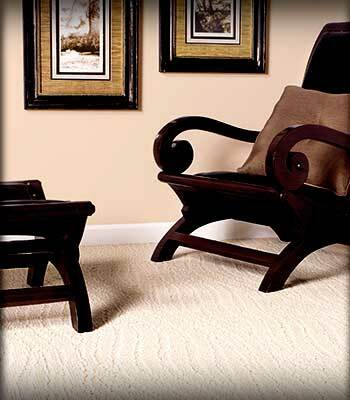 A better grade of carpet will give you a greater length of service than one of lesser quality. Buy the best carpet you can afford for the heavy traffic areas of your home – halls, stairs, and family rooms. A Medium grade will provide good service in rooms with less traffic – bedrooms and guest rooms. 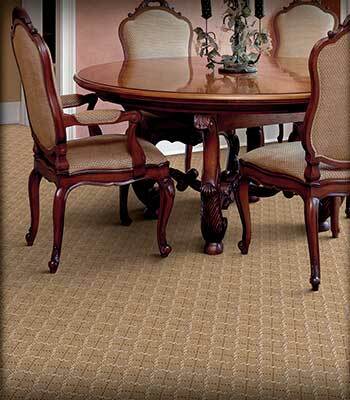 We have wall to wall carpeting from traditional styles to contemporary. 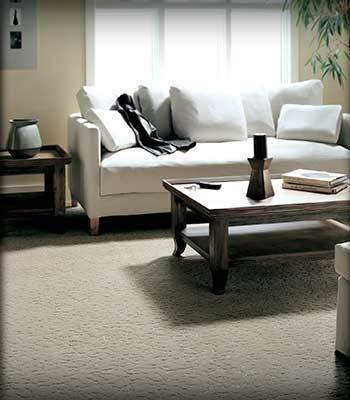 With the newest fibers that make carpet feel as soft as wool with exceptional wearability! We proudly now carry the earth-friendly Dupont smart strand line, featuring fibers made from corn!